Phineas “P.T.” Taylor Barnum (Hugh Jackman) has big dreams. He’s had them since he was a child, sending letters to the girl who would become the love of his life, wife Charity “Chairy” Hallett (Michelle Williams), outlining all of the amazing things he planned on accomplishing when he reached adulthood. Now that he’s an actual husband and father, however, he’s more worried about putting food on the table and ensuring his two beautiful daughters Caroline (Austyn Johnson) and Helen (Cameron Seely) have the happy childhood he never did, these dreams seemingly forgotten. But when inspiration strikes, and with Chairy’s urging, Barnum finds a way to get a loan to open a museum of magnificent wonders unlike any other the world has ever seen. Even so, tickets aren’t selling at the rate he needs if he’s going to keep the bank happy. Thankfully, the imaginative showman has another idea, and after coaxing a number of idiosyncratic performers ranging from a bearded woman (Keala Settle) with the singing voice of an angel, to high-flying brother and sister acrobats W.D. (Yahya Abdul-Mateen II) and Anne Wheeler (Zendaya), to join his troupe of talented oddities, Barnum discovers he’s onto something the general public is falling all over themselves to experience. 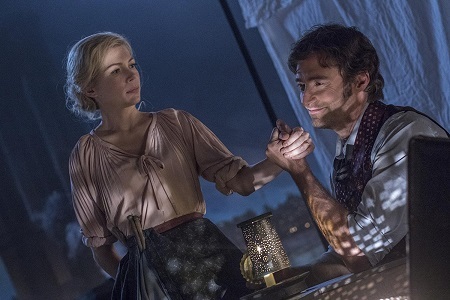 Fact and fiction collide in Australian director Michael Gracey’s musical debut The Greatest Showman, this motion picture not so much an authentic biography of the legendary Barnum & Bailey Circus pioneer as it is an excuse for Jackman to stand center ring and show just how phenomenally talented a song and dance man he is. There’s very little truth here. P.T. Barnum was married to Charity Hallett. Two of their four kids were named Caroline and Helen. At one point the vaunted showman did solidify himself as an entertainment impresario far ahead of his time by taking European songstress Jenny Lind (Rebecca Ferguson) on an unprecedented tour of the United States. After that? While I personally haven’t done a heck of a lot digging, it’s still fairly safe to say Jenny Bicks (What a Girl Wants) and Bill Condon’s (Chicago, Beauty and the Beast) screenplay plays rather fast and loose with anything resembling a historical fact. Considering just how fantastically entertaining Gracey’s musical ends up being, shockingly this lack of historical authenticity as it pertains to the life and times of P.T. Barnum doesn’t prove to be as massive a problem as it by all accounts should be. 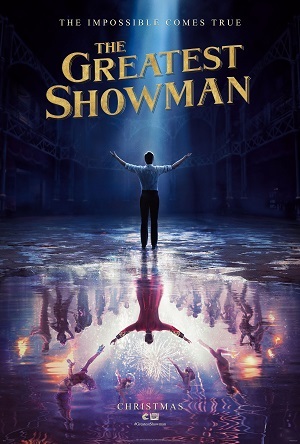 Featuring a bevy of terrific songs composed by La La Land Oscar-winners Benj Pasek and Justin Paul, centered on a charismatically titanic performance from Jackman that’s up there with his all-time best and containing beguiling supporting turns from Williams and former High School Musical heartthrob Zac Efron, there’s so much to love about The Greatest Showman I kind of don’t want to waste a single second discussing its handful of shortcomings, and in all honesty I simply cannot wait to head back to the theatre and watch it again for a second time sooner rather than later. The movie is at its best when it embraces its Vincente Minnelli and Busby Berkeley roots and eschews music video aesthetics made popular for modern movie musicals after Baz Luhrmann utilized them so magnificently with Strictly Ballroom and Moulin Rouge. But where those features made use of their visual pyrotechnics in a way that fit the characters and the stories Luhrmann was attempting to tell, it’s been very hard for pale imitations like Phyllida Lloyd’s Mamma Mia! or Adam Shankman’s Rock of Ages (just to name two) to do something similar. By and large Gracey’s debut avoids overcutting, and much like Minnelli or Berkeley he’s happy to let Jackman, Efron or Settle do the heavy lifting for him, cinematographer Seamus McGarvey’s (Atonement) camera capturing things with a confidently sublime sophistication that’s barely noticeable. If anything, it is the moments when things do get overcut, when the director does start chopping things up into visually chaotic bits and pieces where this musical begins to lose some of its luster. With six credited editors, a list that includes Oscar-winners Tom Cross (Whiplash) and Joe Hutshing (J.F.K., Born on the Fourth of July) and a 105-minute running time that feels much shorter than it actually is, there is a bit of a rushed quality that’s difficult to ignore. The montage covering Jenny Lind’s American tour is particularly haphazard, and if not for a lovely little song of lament and loss featuring a heartbreaking Williams the less said about this sequence the better. But the best numbers are simply out of this world. 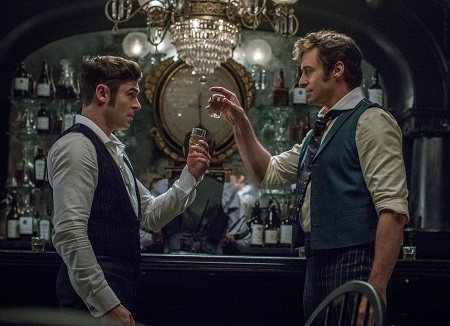 A barroom battle of wills between Jackman and Efron is extraordinary, the pair making like Gene Kelly and Fred Astaire tackling “The Babbit and the Bromide” in 1945’s Ziegfeld Follies. Gracey just lets these two men go for broke, rarely breaking up the action to showcase a differing camera angle, McGarvey chronicling their antics with a velvety effervescence that fits the pair’s athletic elasticity perfectly. 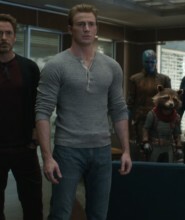 There’s also a sensational duet between Efron and Zendaya as the latter trains for a future acrobatic performance, while an early rooftop dance number with Jackman and Williams is a total stunner that brought an instant smile to my face; a smile that somehow remained all the way through the film until the very end. Then there is the signature central ballad entitled “This Is Me” sung by Tony-winning Broadway superstar Settle. Not only are Pasek and Paul’s lyrics outstanding, the actress sings the song with a heartrending authority that builds into an empowering crescendo that’s tremendous. She blows the roof off of the movie, Settle and the members of the eclectic supporting cast marching through a sea of appalled, hoity-toity big city movers and shakers with a proud ebullience that had my packed preview audience bursting into applause as soon as the number ended. 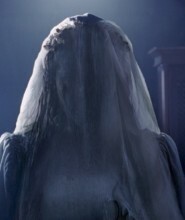 I’m sure a more historically accurate film about P.T. Barnum could be made, one that actually looks at his life and times with an introspective candor this one isn’t even minutely interested in doing. Issues of race, gender, equality, treatment of animals and the exploitation of those outside of the considered everyday norm are admittedly brought up, but for the most part they are dealt with in a moderately melodramatic manner that, while hardly offensive, doesn’t really do any of these topics justice. But as pure entertainment, Gracey’s energetic effort succeeds in a way that goes well beyond anything I anticipated before entering the theatre, The Greatest Showman a three-ring phenomenon the entire family is almost certain to enjoy.